I have been meaning to listen to Neurosis for years. With my appreciation for doom and my great interest in anything “weird”, I had always been told that the band would be my cup’o tea. This was before the years of Youtube and easy torrenting, and I wasn’t about to subject my computer to the horrors of Kazaa so I never followed up on them. Then one day I happened to stumble upon an interview with Brent Hinds of Mastodon. There was a number of famous guitarists listing off their influential albums. After seeing enough entries about Aerosmith or Metallica I was quite surprised to see that Hinds was holding a copy of Neurosis’s Enemy of the Sun. He said that while doing shrooms a friend put on the album and his brain melted. That sounded like an album for me. So I looked and looked for it in record stores, but I could not for the life of me find a copy of this album. Not only could I not find a cheaper used version, but I couldn’t even find a brand new one. 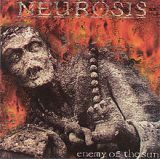 I could find plenty of other Neurosis releases, but not Enemy of the Sun. I even went online and surely enough I could buy one off of Ebay or Amazon, but dammit… I’m a collector. I can’t just buy an album online. I have to experience the joy of FINDING it! Jesus… I was at least able to converse with other metal fans online to see if this album was the real deal. I know tons of Neurosis fans, but not a single one was a fan of this album. Why? Was it that obscure or was I just having some ridiculously bad luck? Even worse, I had been so stubborn that I refused to listen to another Neurosis album until I had heard this one. Call me determined, call me stupid, either way I purposely kept my chastity in hope that it would be worth it. That’s when I was asked by the good men of Metalreviews to take a swing at this album. After a good five years of waiting, I prepared my speakers for the onslaught that hopefully would soon occur. Unfortunately, me not being a participant in the activity of shrooms I am not able to appreciate this on quite the same level as Brent Hinds, but I have at least been able to listen to it under the influence of lesser, greener, leafier substances so I think that I still have a pretty good grasp. And lucky me. This album rocks. That’s right, the sound that emitted from my speakers was sludgy and thick, like thrice brewed coffee. The slow plodding along mixed with the tribal influence in percussion surprised me greatly. I love a good “wall of sound” sound and this is a pleaser. It is easy to see why Hinds would find this band a favorite as Mastodon’s early material seems to be in direct tribute. The songs are long, which is great for me being a Prog Fag. Each song is a private soundscape that starts with little and ends in a flurried blending of noise with riffage hitting me left and right. There is no better song on the album to exemplify this than Raze the Stray. In fact, there is no better song on the album than this and that is saying a lot, considering that there is not a bad song on here whether it be interludes and monologues like Burning Flesh in the Year of the Pig (Which is about that one RATM album cover) or extended sections of proggy doomy sludge like opener Lost. Anyway, back to Raze the Stray. There may not be a better song I have heard in months. Everything about it clicks. The layering of piano, bass that must be strung with elevator cable, and buried screams dies to be heard with headphones. The song, like the album is an experience. This album was well worth my wait. I will eventually grab other Neurosis albums, but I am going to sit on this one for a while. This album will take a while for me to digest. I can easily listen to it in one sitting and during a long night I may give it multiple rotations, but there are so many little quirks and nuances held within that I wouldn’t dare give it less than the attention it deserves. There are many who say that metal is pseudo-intellectual and is more obsessed with appearing to be “intelligent” and “philosophical” than actually being so. In many cases I don’t think that this is too far from the truth, but in Neurosis’s case and especially with Enemy of the Sun, we have here a very smart record by a very smart band. Horns up.